This year one of my resolutions was to do the “365 days of photos” challenge. And so far this year it has been just that, a challenge. I have yet to fail, but I haven’t had as much time to spend on it as I would have hoped. Part of the problem is that I’ve been working so much from home trying to get my new magazine published, that I haven’t been doing very much exploring. However, last week I took a trip to desert botanical gardens in Phoenix and getting some shots there wasn’t an issue at all. The gardens showcase desert vegetation from around the world. The desert has always amazed me. It is such a place of resiliance where so many incredible plants and animals have learned to survive. The gardens bring the desert to life, and the great volunteers there do a wonderful job of explaining things to visitors without annoying them. The flower photographed below was from the wildflower section of the gardens, but I have no idea what type of flower it is. Regardless of the origin, it was still a great sight, and made for an easy photographic target. 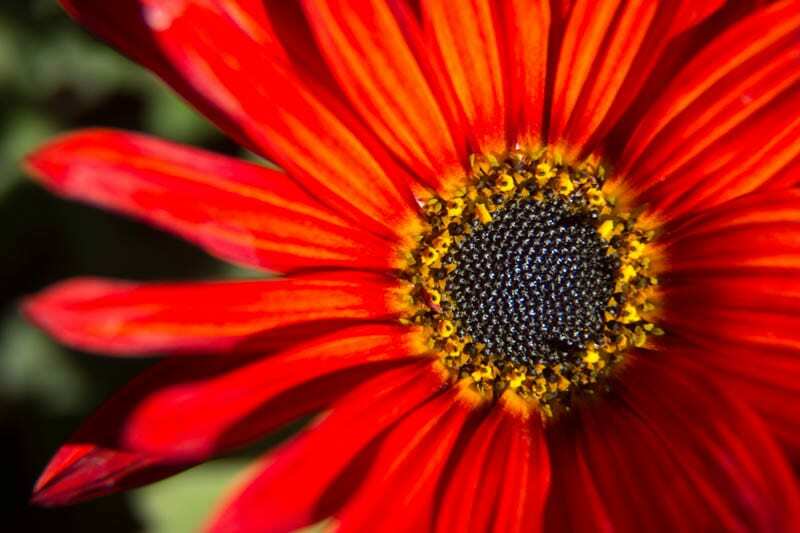 Getting great close-up shots of flowers is all about harnessing soft natural light. This can be a bit of a challenge in bright areas like the desert. The light of the sun can cause burn out of the plant’s colours and a lot of strange and uneven light and shadows. One of the best ways to cure this is by finding a way to diffuse the light. A white bed sheet does the trick if you don’t want to buy a fancy one from the photography store. This should scatter the light and create a much softer light on the plant you are shooting. A tripod is also essential for getting a really sharp image. I shot this image using a 18-135mm lens with a macro extension tube attached. The image was shot at a focal length of 67mm, an f-stop of f/5.6, a shutter speed of 1/250, and the ISO was at 100. Christy, I actually didn’t have a sheet with me… instead, I used my t-shirt as a shade. Nothing like a little resourcefulness.